Whilst much attention is paid to what medium to paint with, what brushes to use, and so on, the surface on which we are painting is often overlooked. Some people may try to paint a masterpiece on a piece of paper, sometimes with disastrous results, others will swear that they need stretched canvas for a simple sketch or experiment, when they would be better off practicing on paper or board. Whilst many people consider canvas to be the golden standard for painters, it is not the only medium to use, and many artists really are better off with other media, for various reasons. Canvas: Canvas is a medium that is relatively expensive, although, thankfully, relatively inexpensive readymade canvases are available from many art stores these days. Canvas requires some care as a stretched canvas can become easily damaged if not handled correctly. The surface of the canvas is ideal for detailed work and for the gradual layering of paint, but for thick paint and bolder work it may be quite unnecessary. 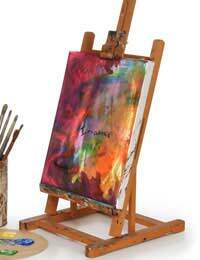 Also, if you wish to glue objects or paper to your painting canvas may not be the ideal surface. Canvas must be primed either with acrylic primer or with ‘rabbit skin glue’. Cardboard: Cardboard is a very inexpensive medium that compared to a paper is relatively hardwearing. Taking a piece of cardboard simply cut it to the required size and prime it with acrylic household paint or PVA glue. The bumpy surface of cardboard may not allow for a very smooth effect, but otherwise this an ideal readily available medium for acrylic, oil and gouache, but not for watercolour. Board: Board such as chipboard, ply, and mdf can be ideal for painting in oil or acrylic. Simply cut the board to size (or buy it ready cut), prime it with household emulsion or acrylic primer and it is ready to paint upon. Board has been used by artists for centuries in place of canvas and is a much harder wearing alternative, ideal for thick paint and for very physical expressive painting. Board can be screen printed upon prior to painting, and is ideal for sticking paper and objects to prior to or during painting. Different types of board have different textures and therefore will produce different effects. Paper: paper comes in many different varieties suitable in varying degrees for painting in different mediums. Watercolour is of course ideally suited to watercolour paper. Other mediums can be used with paper, but some care must be taken to ensure that the paper does not buckle. Ideally fix larger sheets of paper to a drawing board using brown tape (the type that is made sticky by applying water to one surface). Oil is best not used with paper, and some alternatives such as cardboard or card can be used instead. Acrylic is best used with very thick paper, such as ‘Fabriano’ paper, which is also ideal with watercolour as it is so thick and absorbent. We can see from the above that whilst canvas is a great medium, there many alternatives, and it is well worth taking time to find the one ideally suited to you.